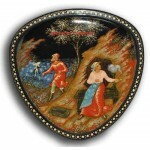 School: Palekh Artist: Yevgeniy Myznikov Size (inches): 3.75x1.75 An exquisite piece of Russian artistry, this Palekh lacquer box was hand crafted, painted and polished according to..
School: Palekh, 1996 Artist: Vladimir S. Prokofiev Size (inches): 7.25x5.125x1.75 A truly unique piece of Russian artistry, this exquisite Lacquer Box from the village of Palekh was hand c..
School: Palekh Artist: Kostrova A. 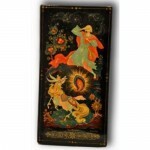 Size (inches): 4x4x1.5 This amazing example of Russian lacquer miniature painting was created by a talented artist Kostrova A. from the village of Palekh..
School: Palekh, 1997 Artist: Evgenyi Myznikov Size (inches): 5x1.5 This beautiful Palekh lacquer box features one of the most favorite Russian fairy tales, the Tale of the Dead Princess an..
School: Palekh, 1982 Artist: A. Drozdov Size (inches): 12x6.1.25 Russian Treasure proudly presents an exclusive one-of-a-kind masterpiece, a unique Palekh lacquer box, made in the times of..
School: Palekh Artist: Kukharkin Size (inches): 1.75x1x3 This beautiful Gazebo-shaped Palekh lacquer box was designed and hand-made by famous Russian artist Kukharkin, it features a scene ..
School: Palekh Artist: Kondakova Size (inches): 2.75 diameter, 3 inches tall A fine example of Russian lacquer miniature, this Palekh lacquer box features one of the most fav..
School: Palekh Artist: Kornilov A. 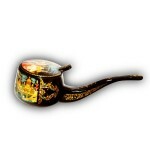 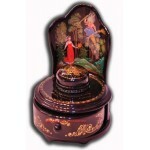 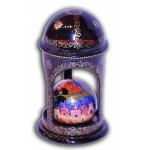 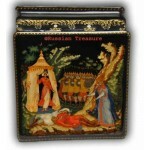 Size (inches): 5x4x0.8 This enchanting piece of museum quality - authentic Palekh Lacquer Box, showing a recognizable scene from outstanding Pushkin Fair..
Palekh Lacquer Box - Pipe of Peter The Great is a unique shape paper mache lacquer box designed in the spirit of Peter the Great and St. Petersburg. 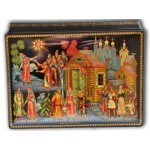 ..
School: Palekh Artist: Smirnov Size (inches): 2.5x2.5x3.5 From the very first sight at this Palekh Russian box “Vasilissa the Beautiful” you will be stricken with its exceptional detailzat..